Fonts are fabulous things. They're even better to make, although yes, it does take a LONG time to fine-tune a set of letterforms and get the spacing and kerning just right. Enjoy these fonts. They are all free to use for commercial and non-commercial projects alike. If you have any questions or type commissions for me, get in touch! Akzidenz Freena is a font created directly from wooden type letterpress prints, grunge and all. Constanca Folded recreates a folded paper design by Constanca Costa. 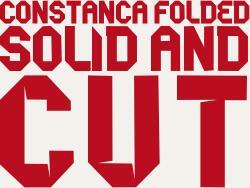 It has two weights: cut (regular) and solid (bold).